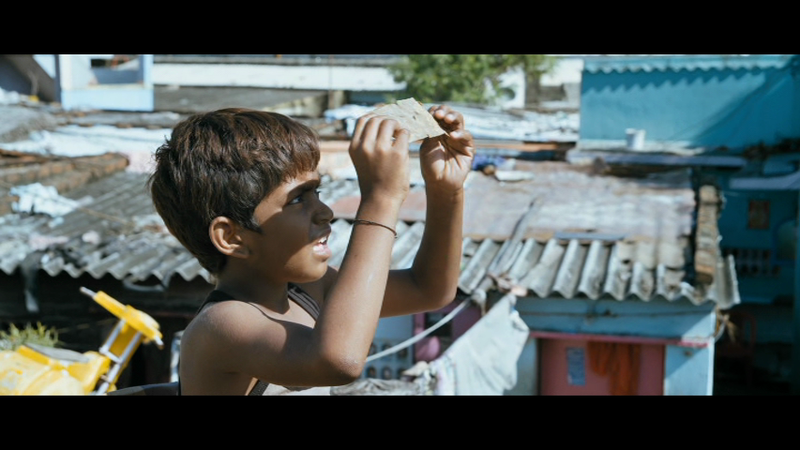 Kaakka Muttai is a little gem of a film that premièred at the 2014 Toronto International Film Festival and subsequently screened at a number of Film Festivals around the world before winning two National Awards earlier this year. 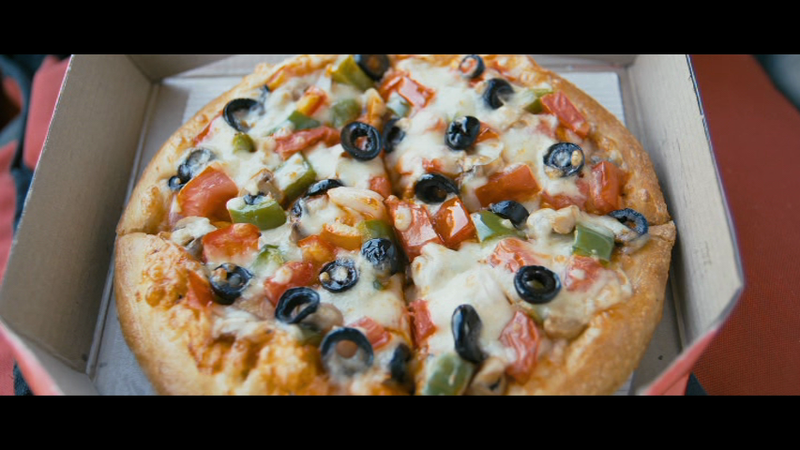 It tells the story of two young brothers and their quest to raise money to buy a pizza when a new shop opens up in their area. However this isn’t as easy as it sounds. 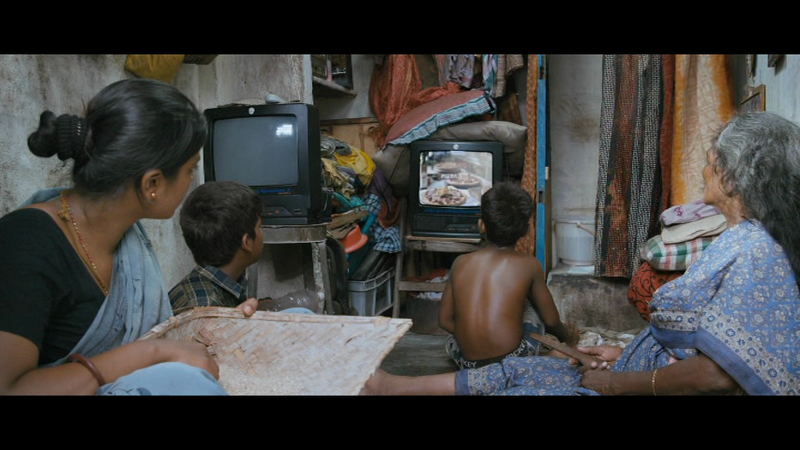 The two boys live in a slum area and finding enough money for their day-to-day necessities is difficult, never mind Rs. 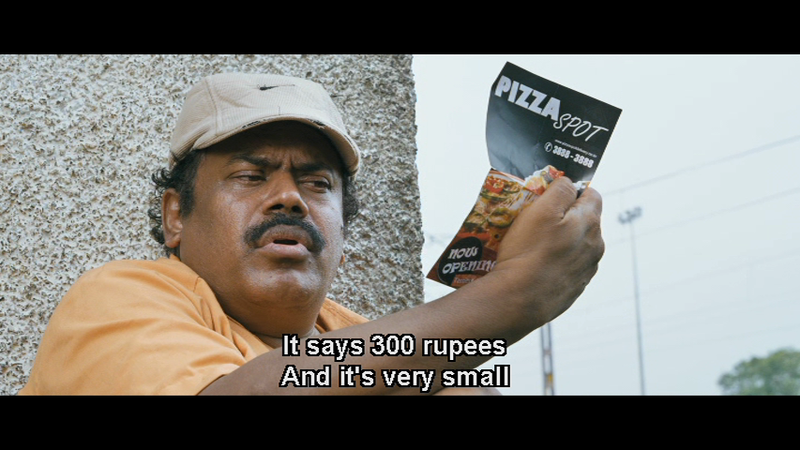 299 for something as exotic as a pizza. 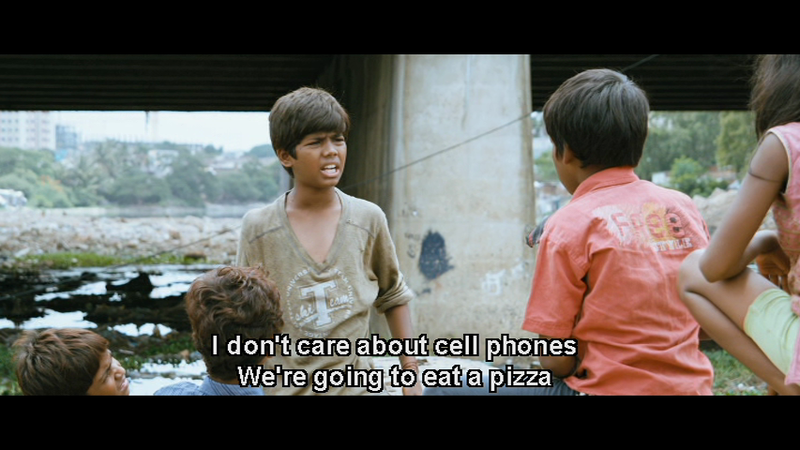 As they set about achieving their goal, the story touches on poverty, corruption in politics, globalisation and the daily cons run by locals in the area, but mainly it’s the story of two young boys and their quest to buy their very own pizza. 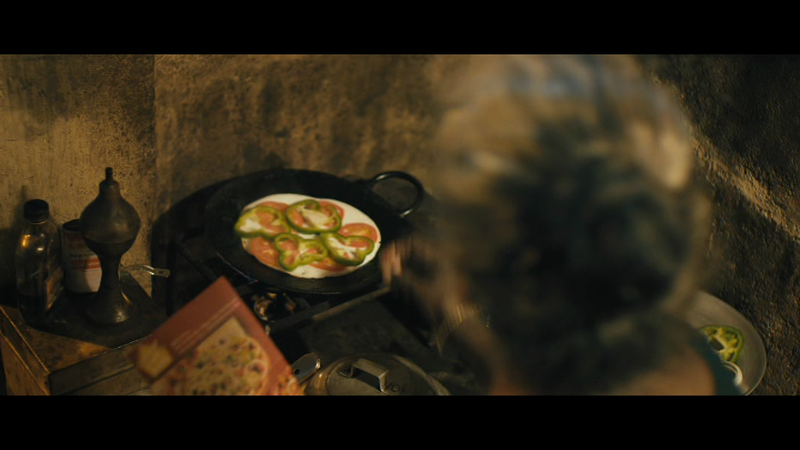 We never find out the real names of the two brothers in the film as they refer to themselves as Periya Kaakka Muttai (big crow’s egg) and Chinna Kaakka Muttai (little crow’s egg) after their habit of eating crows eggs when they can find them. Chinna KM (Ramesh) tempts the crows down from a tree with rice secreted away from under his mother’s watchful eye, allowing Periya KM (Vignesh) to climb up and find the eggs. Their nest robbing is one of the early scenes and the charm of the two brothers is captured by Periya KM’s response when he finds 3 eggs in the crow’s nest – he divides them up as one egg for each of the brothers and one left for the crow – such equality! 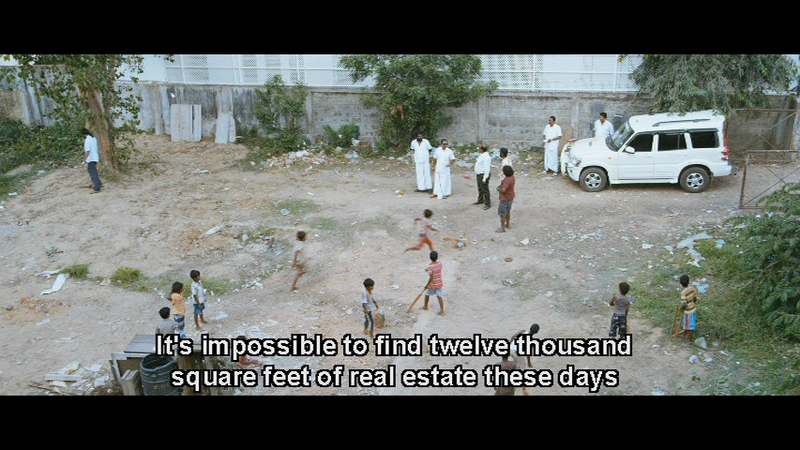 The two brothers live in the slums with their mother (Iyshwarya Rajesh) and their grandmother (Shanthi Mani) while their father (Nivas Adithan) is in jail. They live in a small one room shack which is clean, tidy and incredibly well organised despite the surrounding squalor on the streets. Much of the family’s money goes to a lawyer, who is supposed to be working to free their father, but there seems to be no progress in securing his release. There is never any mention of the father’s crime or how long he has been in prison which deliberately keeps the audience in the world of the children who also have no idea what their father has done and don’t seem to care. 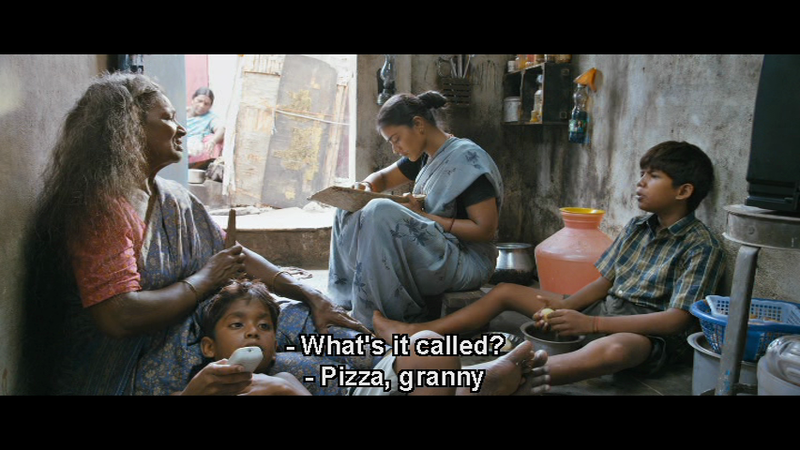 This technique of showing their world through the eyes of Periya KM and Chinna KM is one of the charms of the film. Life is simple for the brothers. They look for the crows’ eggs on a waste piece of land where their friends play cricket, spending the rest of their day collecting coal along the railway lines and selling it to supplement their mother’s meagre income. Like all children they ask their mother for things well outside what she can afford; a TV and a mobile phone seem impossible when she cannot even afford to send the boys to school but the brothers happy go lucky approach to life seems to serve them well. However one day the developers move in and the land where the crow makes its nest and the children play is cleared to make way for a new pizza restaurant. 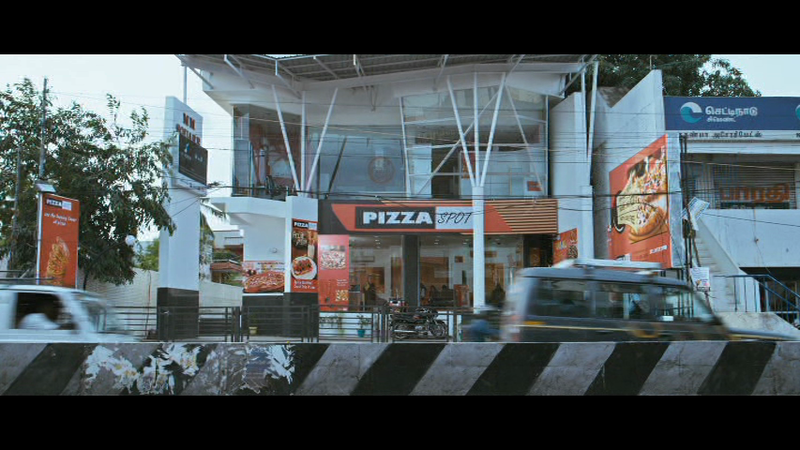 Despite being forced out the children are ecstatic when the new pizzeria is completed and movie star Simbu comes to open the restaurant and eats the first slice of pizza. Watching him enjoy the novel dish is enough to convince the brothers that this is something they need to try for themselves and they begin the arduous task of raising the necessary money to buy their own pizza. They are aided in their venture by a friend from the railroad tracks. Pazharasam (Joe Malloori) or Fruitjuice as the subtitles decide to translate his name, works on the railways but is happy to talk to the two boys and helps them find coal to sell. It’s obvious to the audience that the coal he leads them to is not free for the taking, but Periya KM and Chinna KM don’t seem to realise that this isn’t just a pile of forgotten coal and are deliriously happy that they have found the means to raise enough money to finally buy pizza. However they are quickly brought back down to earth when the restaurant security immediately calls them slum kids and refuses to let them in to buy their pizza even though they have sufficient funds. Just having the money isn’t enough and Periya KM and Chinna KM have a new goal – to raise enough money to buy new clothes that will allow them to entry to the pizzeria and their dream of pizza. Vignesh and Ramesh are perfectly cast as the two young brothers and have plenty of impish charm and infectious energy as they roam around their area. 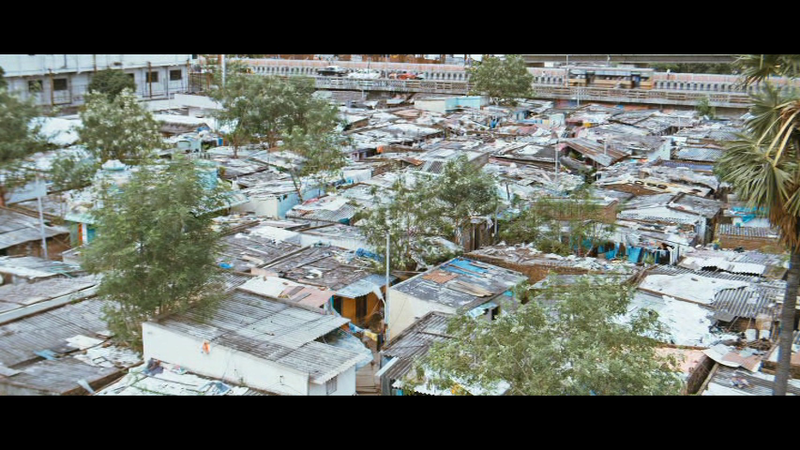 There are plenty of note-worthy moments and small vignettes that give the whole film a feel good factor that is normally missing in films about slum dwellers. Watching the brothers wash clothes (Chinna KM wets the bed every night) allows Manikandan to juxtapose the younger brother throwing up wet clothes for his older brother to catch and hang up with a moment where the elder is distracted by watching a plane go past in the sky. His younger brother hits him in the face with the next item and the laughter chases away that brief moment of dreaming by Periya KM. There is another where Chinna M finds a toy watch in the scrap yard where they sell their coal and then takes it to a watch maker to make it work – the mix of Chinna KM’s delight in something so small as the watchmakers magnifier and his innocence as he tries to understand why his watch doesn’t work makes for beautiful cinema. 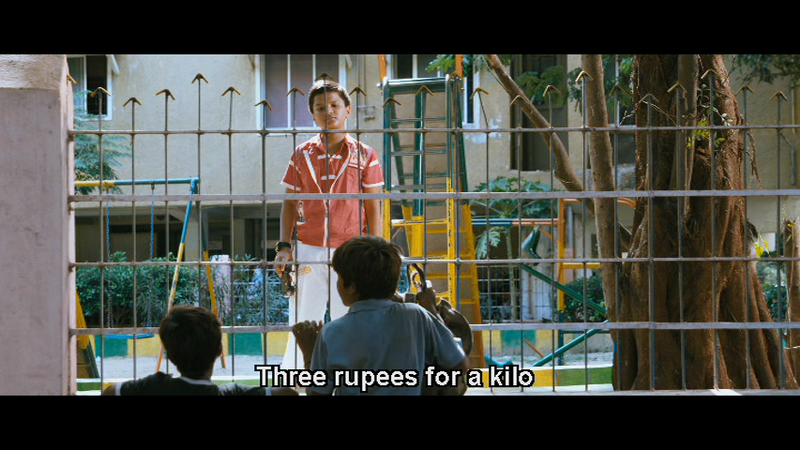 And Manikandan keeps them coming – there is the grandmother trying to make pizza for the boys when she discovers how desperately they want it, the boys attempting to sell their dog to raise money and their friendship with a richer kid who they speak to across the barrier of a metal fence. The physical barrier is nowhere near as daunting as the social divide which keeps Periya KM and Chinna KM firmly in their place but their determination is inspiring. Iyshwarya Rajesh too puts in an incredible performance as the boys’ mother and perfectly balances pride, ethics and desperation as she tries to cope without her husband and bring up her boys as best as she can. Later scenes of her interactions with the local politician and with the police are perfectly done to give her grace and dignity in trying situations and the conversations between her and the grandmother are beautifully natural. In fact all the performances are excellent with each member of the cast seemingly perfectly in their roles. Other stand-outs are Ramesh Thilak and Yogi Babu as the two local conmen trying to make a quick buck out of the brothers misfortune and Babu Anthony as the pizza shop owner, while Joe Malloori and Shanthi Mani are simply brilliant. This entry was posted in Kollywood and tagged Babu Antony, Iyshwarya Rajesh, Joe Malloori, Kaakka Muttai, Manikandan, Nivas Adithan, Ramesh, Ramesh Thilak, Shanthi Mani, Simbu, Tamil, Vignesh, Yogi Babu. Bookmark the permalink. I’m sure you’ll enjoy it – the kids are just amazing! I was going to but it was already a very long review! It’s such a gorgeous little film – I say little because it’s not very long and the two stars are kids – but it’s really a big film in terms of story and impact. This is one of the best award winning best films of the year. Really an awesome story which has so many layers to it. The casting and the acting of the two leas children and other characters is just awesome. 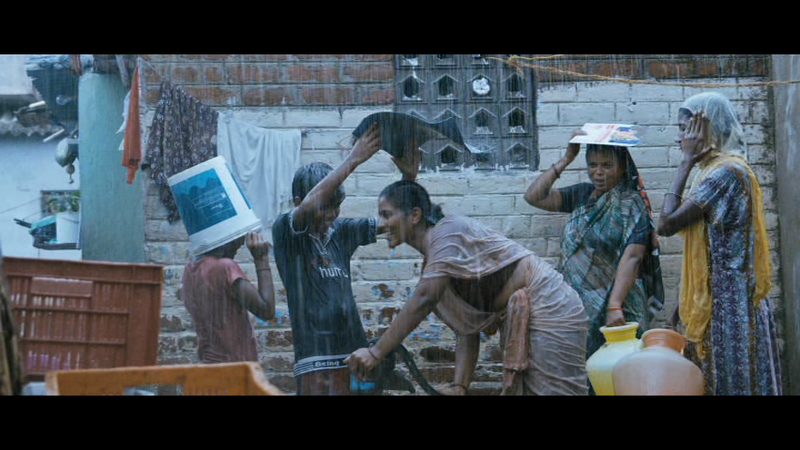 The film is brilliant technically as well with Direction and Cinematography by Manikandan and Music by GV is also good. Loved the movie for the innocence of the children that was portrayed in the film. It was so real that it drowns the other people in the film. The kids were fantastic! Just so cute – they reminded me very much of some children I met when working in Poompuhar a few years ago. Same cheeky grins and happy attitudes 😀 They were absolute stars! I think this might just be my favourite film of the year – as you say there are many layers to the story and the characters are uniformly very well written. Such a great film on every level!